Thinking of having a wedding in an attractive location far away from home? You have a double thumbs up from us on that thought! Destination weddings appeal to different people for different reasons. Whether it is just a vacation spot you want to escape to or simply want to run away from the boring traditional wedding, or want to streamline costs, whatever be your reason, a destination wedding is a great way to spend a lot more time with your guests and family away from all the shorgul of the city and surrender in to the beauty of an unknown location. But, what if this whimsical wedding of yours doesn’t include guest transportation and accommodation cost? How do you communicate this piece of news to them in the most subtle manner, without having them scrap the idea of attending your wedding? Destination weddings should be treated in the same way as a wedding in your hometown. You don’t pay for your guests stay and travel to your venue if it’s a wedding in your hometown, then why not follow the same rule for destination weddings?! While this idea may not go down very well with many of the guests you invite, they will eventually come around if you treat them well and make them realize that you’re already paying enough for the celebration and giving them the opportunity to be whisked away for a cool vacation filled with lots of fun and fanfare. This week we help you organize your destination wedding planning checklist with smart ways to communicate travel plans to your guests if you’re not paying for them. Though 6 months in advance sounds like a fair deal, a year in advance is even better. When guests know it’s a destination wedding, immediate question arise – Are travel and accommodation costs included? With 6 months or more in hand, you have enough time to communicate to your guests about inexpensive travel and accommodation options. The earlier they book, the cheaper it'll be and likelihood that they will attend will be higher. Try and arrange for a travel agent who will give you discounts on bulk bookings. Send information of the agent to all the invited guests much ahead of time so they can avail all the great offers. Save-the dates allow you to be as charming and as quirky as possible. This is the best space to casually mention the 'bear your own cost detail' about wedding ‘expenses’ in a light-hearted manner, yet communicating what needs to be communicated. Along with your invitation cards attach a travel packet that gives complete information on how people can actually make it to your destination wedding. This way they can make an informed decision and arrange for their travel and stay accordingly. If you’re having a destination wedding out of the country, certain visa officers demand to see the wedding invitation card. So, if you don’t want your guests to be stuck at visa application process ensure you send the invites out at least 4 months in advance. Don’t leave your guests hanging loose with providing information only of where the wedding is taking place. Make sure your travel information kit has information of what flights or other transportation means they need to book. Also, give out a map to the destination, if it’s a location unknown to all. If it’s a destination, where one cannot drive to with their own vehicle, provide information of any rental cars or bikes available in town, as well as the duration of the travel. The easier you make it for them to reach to your wedding destination, more chances of them attending your special day. Not all your wedding guests can afford the high-end accommodation or travel plans you suggest to them. Give them multiple options when it comes to accommodation with different price points. Ensure the stay options you provide are at close proximity to your wedding venue, if you don’t want them to be arriving one day prior to your wedding, but late on the wedding day. Arrange for local transport so it's easy for them to get to the wedding venue. Since it’s a wedding away from home, your guests who do confirm to attend will definitely come with the expectation of a mini-vacation of their own before or after the wedding. Ensure your travel packet has a tentative detailed itinerary of listing the events they need to be a part of and plan their day accordingly. You don’t need to add a fixed time to all your events, delays are bound to occur, but it’s wise to add a ‘TBA’ tag if unsure to keep your guests in loop. Add nearby tourist attractions, activities and restaurant details your feel your guests will be interested to check out. Assist your guests in determining which package is affordable to them. Enquire in the hotel you will be staying in, if there are any discounts or promotional packages available to accommodate your guests. If not, do a little research and provide your guests with details of the best hotels nearby, this will lessen the burden of having them plan the attendance all by themselves. When your guests have made all the efforts to reach your wedding destination, it becomes obligatory on your part to make them feel welcome. When your guests arrive, arrange for refreshers, goody bags or sweet treats as a welcome gift. This will help to get their mind off the jet lag or the travel crunch they’ve been through and kick-start the celebration mood. With your guests spending a substantial sum to reach your destination wedding, arranging for ground transportation is a sweet gesture. Confirm if your hotel provides free shuttle service, if they do, this should pretty much help you cut short the expenses. If not, request the hotel to suggest local shuttle service. If ground transportation doesn’t fit your budget, hand out contact numbers of local shuttle service providers and share it with your guests. Saving the best for last, what you MUST NOT FORGET to do is thank your guests for making it to your special day in your wedding speech. Mention names of people who’ve had a tough time getting to your destination, just to make them feel that it was all worth it. Address your guests, make them feel welcome and keep them entertained. Have your guests leave your celebration with just bucket loads of good memories. While all of this might require a lot of time investment, it is the most optimal way to plan your destination wedding. So shy away from the thought that a desitnation wedding is only possible for you in case you have enough moolah to pay for everyone. Sharing costs is the new way to do things. And while you will ensure that planning to attend your wedding becomes a cakewalk for your guests, you don't have to pay for everything. 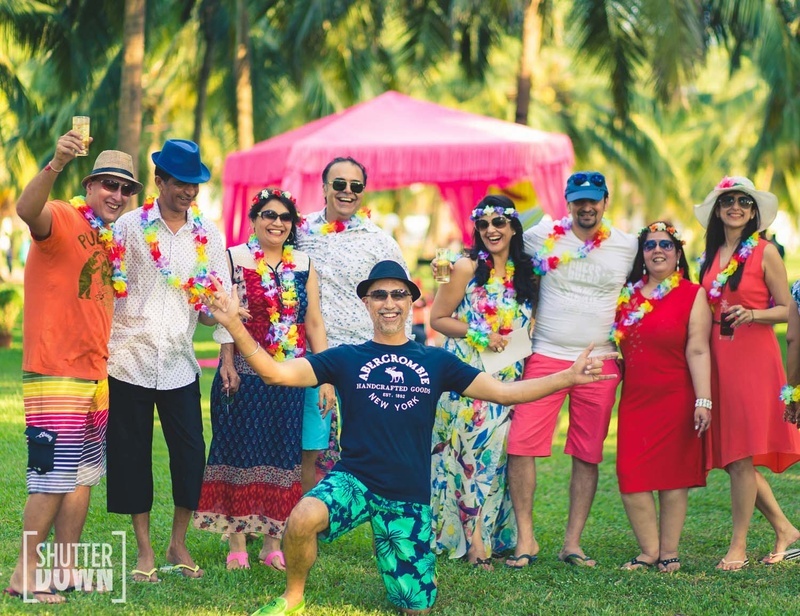 >How to Make Your Destination Wedding a ‘Cool Affair’? >Incredible Guest Engagement Ideas for Destination Weddings!